With seven professional designations and a client roster full of small business owners, this Arizona-based advisor produces award-winning results. Eric Pyles, owner, Cambridge Financial Services. It might not have seemed like it at the time, but Eric Pyles made the right career decision. With a bachelor’s in finance followed by an MBA from Arizona State University, Pyles had some decent job prospects when he was looking to begin his career 14 years ago. He thought about being a financial advisor or going the corporate finance route. It was a commission job, and he was told he probably wouldn’t make as much money as he was currently making (Pyles had a full-time job as he went through his seven years of college education to earn the MBA). He would have to work many hours and it would be tough. Easy choice, right? Take the great offer! Just as promised, he didn’t make as much money that first year. 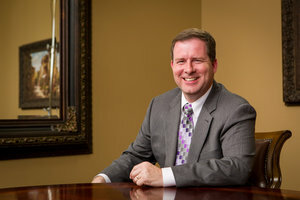 Today, Pyles is a financial advisor and partner at Cambridge Financial Services in Chandler, Ariz. He is also the reigning Financial Professional of the Year for the Penn Mutual Life Insurance Company, an award he earned in 2013 as a producer of both Penn Mutual and Hornor, Townsend & Kent, Inc., Penn Mutual’s wholly owned subsidiary. The award recognizes a producer who has demonstrated the highest standards of continuing education, performance and ethics in helping clients achieve a lifetime of financial well-being. To even qualify for the award, a producer must have earned the Chartered Life Underwriter (CLU), Chartered Financial Consultant (ChFC) or Certified Financial Planner (CFP) designation, and have qualified for HTK’s Chairman’s Club or Leaders Conference. Pyles has the designations covered – and then some. In addition to holding the CLU, ChFC and CFP designations, Pyles has earned the Chartered Advisor for Senior Living (CASL), Life Underwriter Training Council Fellow (LUTCF), Registered Employee Benefit Counselor (REBC) and Registered Health Underwriter (RHU) designations. “First, let me tell you that these designations have been very helpful,” Pyles said. “I knew that I needed some credentials if I wanted to get right into the business market and having these has helped with that. Also, as I reach out to try to form new relationships with more CPAs, it helps because they see that I am dedicated to my field. Pyles has built his highly successful practice at Cambridge Financial by specializing in working with small businesses and their owners on business succession planning strategies, developing employee benefit packages and personal planning. “His ability to provide comprehensive financial advice to these clients through his extensive knowledge base and sound ethical principles makes Eric one of Penn Mutual and HTK’s most successful advisors,” Stevens says. Pyles says he knew when he first started that he wanted to work with business owners for a couple of reasons. First, they thought like he did, as he has always thought of himself like a CEO of his own company and ran his practice that way. The second reason he wanted to target small business owners is because he needed to stop working evenings so he could be home with his family. Pyles had one child and another on the way when he started this business, and now he and his wife Kim have six children. “I knew working with business owners they would want to meet with me during the day,” he says. This idea did not become an overnight success, but within about six months Pyles says he started seeing some great results. Another key to building the practice? Partnering with those other professionals. “The best thing we have ever done with our practice is to align ourselves with CPAs and other professionals, and this is now where we get the majority of our new clients,” Pyles says. But it wasn’t easy. Moving into employee benefits was only natural for Pyles after developing a client roster full of small business owners. He now does employee benefit plans for a majority of his clients. He says employers today are really looking for plans that can help reduce their taxes. “As our current government believes in taking from those that work hard and are successful to support others, the business owners I have been working with are feeling this pinch and are very interested in strategies to reduce that burden,” Pyles added. Pyles goes into every meeting trying his best to get to know the person and their business. He doesn’t have a formal process, and while he has a short questionnaire, he usually doesn’t follow it. “I just try to talk to them and get to know them, and through the process I understand their concerns and things that I can assist them with. It’s safe to say it’s working for Eric Pyles.